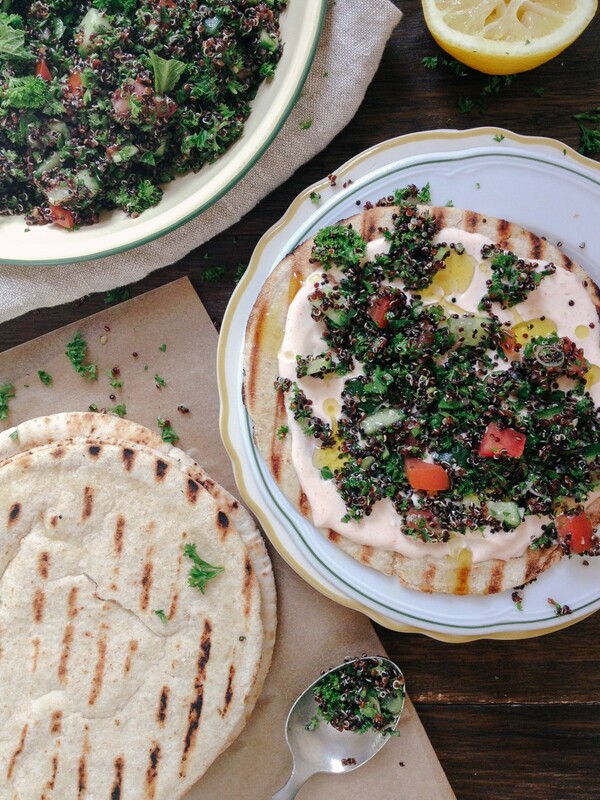 This Jerusalem food post is from Claudia Tavani from My Adventures Across the World. The first thing I learned visiting Jerusalem is that there is no such thing as going hungry there. And, I’d dare say, the chances of eating a seriously bad meal there are very slim. In Jerusalem food is always fresh and full of flavor. For example. simple bread or nuts from the Mahane Yehuda Market, a quick meal in a local eatery, or a 4 courses one in an upscale restaurant. 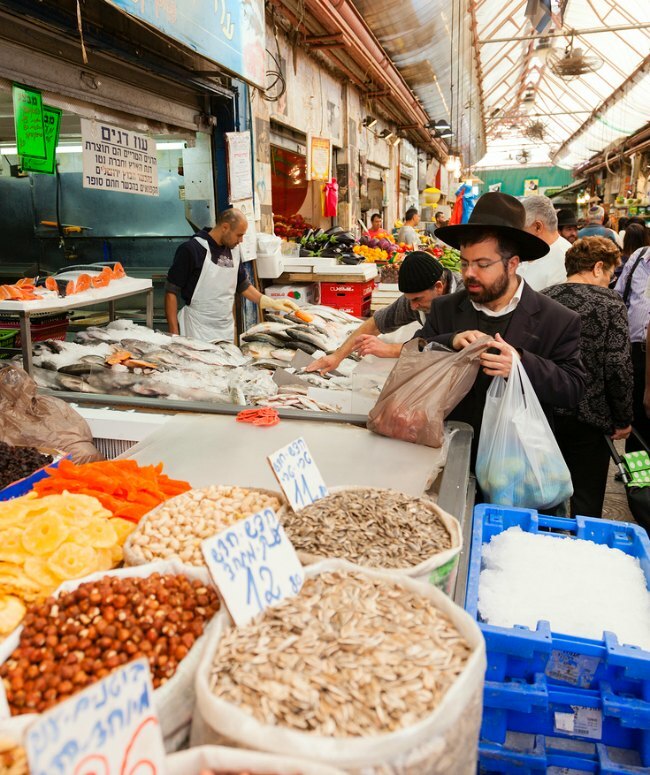 Jerusalem is quickly becoming one of the food destinations in the world. Ultimately, it has a large number of incredible restaurants that pair a love for quality ingredients, slow food and a great ambience for the perfect dining experience. Israeli food is an incredible mixture of flavors and cuisines. It borrows from an incredible repertoire, which includes Moroccan, Polish, Hungarian, Russian, French and Yemenite cuisine, and many more. Palestinian food is typically middle-eastern, but just as tasty. Food in Israel is generally healthy: people here eat lots of fruits and vegetable. It normally uses olive oil for cooking or seasoning. Yet, they also like red meat, which is served at most meals. However, there is a great variety of vegetarian and vegan dishes. There is an increasing number of restaurants offer good vegetarian and vegan options. It’s thus easy to see why eating is one of the top things to do in Jerusalem. So simple, yet so important, bread is one of the most delicious Jerusalem food. The most common Palestinian bread is the flat unleavened bread which usually accompanies every meal and takes different sizes and flavors. Yet Israelis love pita, which is also unleavened and comes in different varieties, including wholemeal. A good pita stuffed with salads and falafel (see below) or meats makes for an excellent meal. Also another kind of bread, which is most commonly eaten during Shabbat dinner, is challah. But it is thick and on the dry side, and a little bit sweeter than regular bread. Beigeleh (in Hebrew) or Ka’akh (in Arabic) are huge loops of bread. While the whose texture is similar to bagels, which are coated in sesame seeds often sold in little carts all around the Old City and the Muslim Quarters. And it is perfect for dipping in hummus. 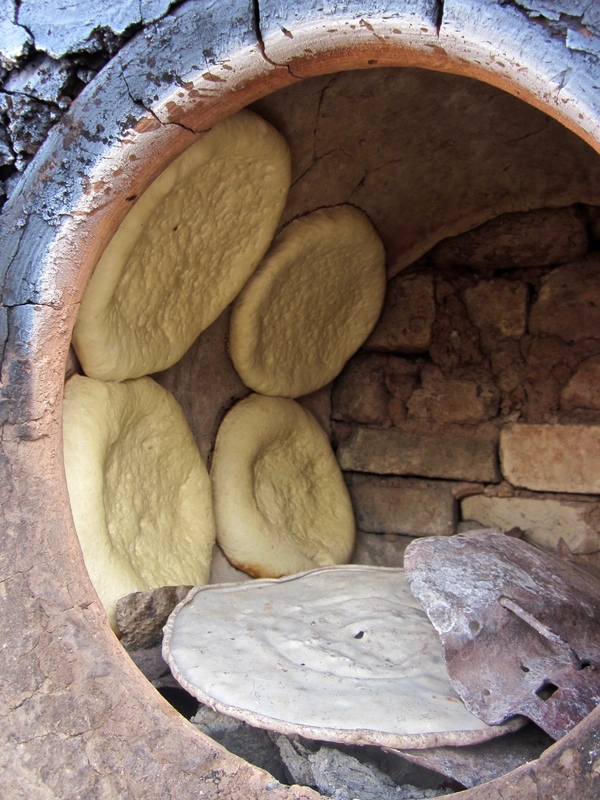 Lepeshka is a round, crispy and fluffy bread typical of the Central Asia Jewish community. It is sold in bakeries around the Bukharan Market (Shuk ha-Bukharim). During Passover, bread is officially off the menu and replaced with matzah, which looks like unleavened crackers. Yet, this doesn’t have much of a taste at all. The unmissable snack to be eaten in Jerusalem is falafel. This is a ball of chickpea meal with fresh herbs and spices. Next, they are deep fried and eaten alone or stuffed in a pita along with some salad, tahini (sesame paste), hummus (see below), and possibly pickles. Also, a falafel sandwich makes the best meal on the go in Jerusalem. The best falafel sandwiches can be found around the Mahane Yehuda Market. Hummus is ever present a proper Israeli meal. And one can’t truly say to have tried hummus until having visited Israel, as Jerusalem has some of the best hummus places in the country. This is a blend of chickpeas (usually dry chickpeas, left to soak overnight), top notch quality tahina, garlic, lemon, salt and good quality olive oil. Also there are other kinds of hummus, for which other beans are used. Yet, they are always delicious. Hummus is best enjoyed with freshly baked, warm pita bread. One of the best places to have hummus in Jerusalem is Acramawi – a tiny eatery not far from Damascus gate. Baba ghanooj is a dip made with pureed grilled eggplants and olive oil. And it is delicious with pita. Sabich is an incredible tasty dish of grilled eggplant, boiled potatoes and eggs, salted cucumber, tahina, salads and amba (spicy mango sauce). This Jerusalem food is usually stuffed in pita bread. But upper scale restaurant such as Adom, located at First Station, also serve it as an appetizer, in a bowl. Shwarma is the carnivore’s budget alternative to falafel in Israel. It consists of a stack of thin slices of meat (usually beef or lamb) skewered vertically and spun slowly in front of a roaster. And it is then served pretty much in the same way as falafel. 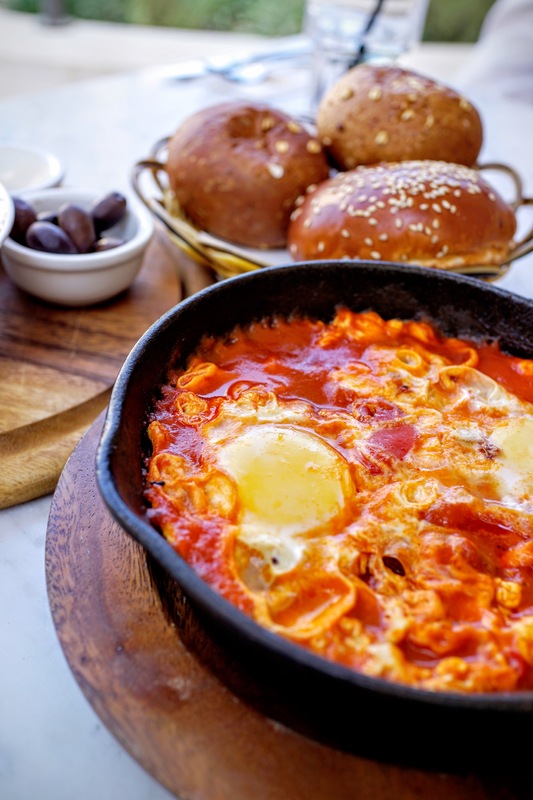 Shakshuka might be the most popular breakfast dish. It is originally a Moroccan dish of eggs fried with tangy sweet tomatoes. Additions may be goat cheese, grilled eggplant or even sausage. An alternative to shakshuka is boreka, a dish of Balkan origins consisting of a puff pastry with a variety of fillings. And the best ones are with mashed potatoes, cheese, mushrooms and olives. Jachnun is typical of the Yemenite Jewish community. It is a pancake made of layers of phyllo dough which are rolled in a tube and slow-cooked in the oven. They are served with a dip of pureed tomatoes and fenugreek. Yet, the best are found at Jachnun Bar. Sambusak, whose roots are the same of the Persian word “samosa” – and in fact they are quite similar to the samosas one can get in India. While they are normally filled with mashed chickpeas but there also are ground meat or mashed potatoes version. They can be found from street vendors around Mahane Yehuda Market. No Israeli meal is ever complete without a choice of salads on the table. Salads are often served as appetizers – mezze style. But it is also possible to find huge salads served as a full meal. A must try salad is a combination of finely chopped cucumber, tomato, onion and lemon juice topped with tahina. But also, other local favorites include coleslaw, carrot salad and tabbouleh (finely chopped parsley with tomatoes, bulgar wheat, seasoned with olive oil and tahina). Nothing is better than a bowl of hot soup during winter. The Kurdish red kubbeh soup is a classic. 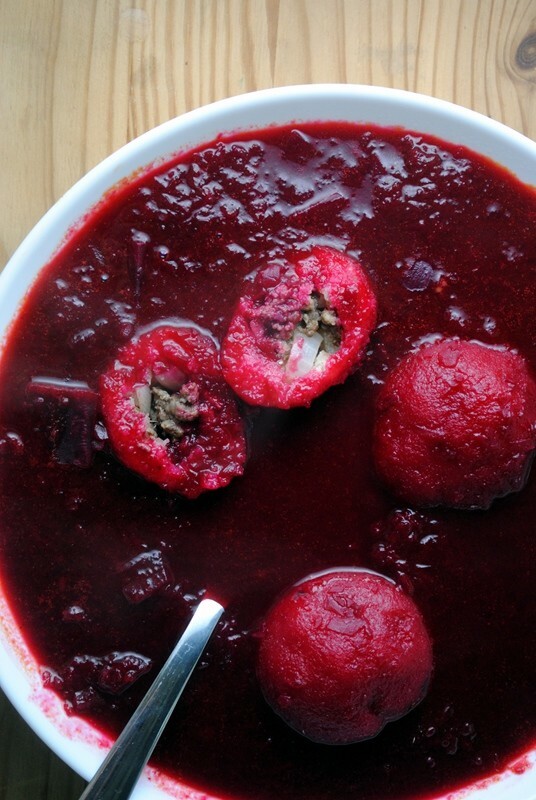 Red kubbeh consists of a bulgur dumpling and semolina. These are stuffed with meat and served in a tangy broth of beets and roots vegetables. The best place to try it is Mordoch. Perhaps this dish is not for everyone, the Jerusalem mixed grill, or me’orav Yerushalmi, is considered a delicacy. It is made of chicken hearts, spleens and liver mixed with bits of lamb. It is cooked on a flat grill and seasoned with onion, garlic, black pepper, cumin, turmeric, olive oil and coriander. Finally it is stuffed into a pita. Supposedly Chatzot is the best place to try it. Another chicken dish, much loved by the Arab population of Jerusalem, is the musakhan. This delicious Jerusalem food is roasted chicken, onion and pine nuts served on top of the typical flatbread. Vendors around the Damascus Gate sell delicious musakhan. Maqlouba is a casserole of lamb, eggplant and rice. It is considered to be the Palestinian national dish. Knafeh is a delicious, mouthwatering, heavily addictive cheese pastry soaked in sweet, sugar-based syrup. There are various shops that sell it in the souq, and the Mahane Yehuda Market. 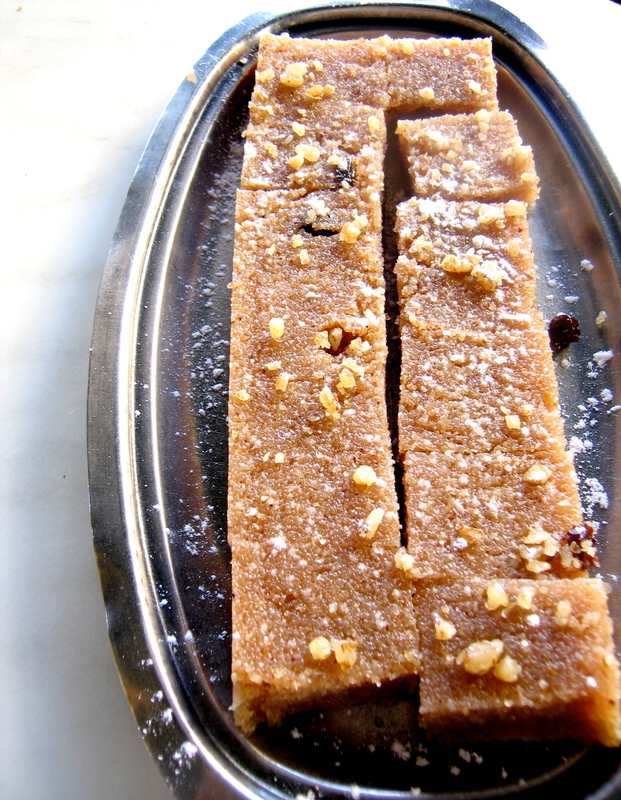 Halva is not just Jerusalem food. It exists across the Middle East, Northern Africa and the Balkans. But the Israeli version is made of tahini and / or nut butters and sugar, and then various other ingredients are added to make different varieties. It is very sweet and it has a crumbly texture. There are many vendors selling halva in the Mahane Yehuda Market. Baklava is a rich, sweet pastry made of layers of filo which are filled with a variety of chopped nuts, sweetened and held together by a dense sugary syrup or honey. There are various kinds (walnuts, almonds, pistachios, peanuts). It is available in the Mahane Yehuda Market. 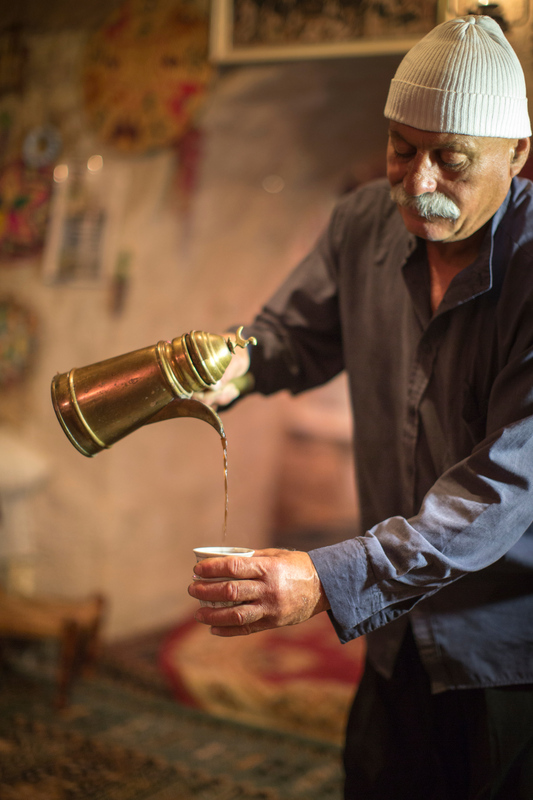 Traditional Israeli coffee can be found in beautiful coffee shops around the market. It is a thick, rich version of mud coffee to which cardamom is added. Did this Jerusalem food post make you hungry? Simply loved it. The information you share is always worth the read. Adding to the feel are your pictures. Keep sharing. The dishes look mouth watering. These are some really interesting information. Thanks for sharing mate! Great article right there. I would definitely have enjoy a culinary tour of Jerusalem for its sweets 🙂 And maybe some Shwarma. you are an ignorant troll! All these dishes are palestinian , I am from jeruslem and now i am a refugee because israel steal my land and my palestinian traditional food. That’s a very interesting observation. Would you be interested in writing something about the Palestinian traditional food in Jerusalem. I’d love to share it.